We always try to reuse old equipment in our projects, in order to save money and help protecting the environment by extending the lifetime of some devices. Also, we didn’t have much money to spend at the time we started building it. Actually, the financial situation hasn’t changed since we’re keeping the membership low (2€ per month) to get more people involved. Having that said, we looked in our “trash” boxes to see what we had that could be used to make an access control system for the hackerspace. We could have just left a computer on running a webserver that we could access via Wi-Fi with our phones, but not everyone has a smartphone. We could also do the same kind of thing with Bluetooth, but once again, not everyone has a cell phone with Bluetooth. Moreover, that would be too simple! Where’s the fun in doing things so simple? Isn’t much more fun to overengineer something? What about a full McGyver challenge? 😛 So, after diving into our “trash” boxes we had something we could work with: a working Siemens C55, a working old computer, one good old ATX power supply, and a DC motor with gearbox removed from a tobacco vending machine. Taking into account the parts we had, we decided to do a GSM Access Control System! The idea we had was to make a system that would allow anyone to open the hackerspace door just by ringing a phone number! How cool would that be? Anyone would even be able to open the door with an old mythical Nokia 3310! 😛 And we could also connect the system to a computer that would keep a log of the entries and sending it to the web so that we could see which members were at the hackerspace in real time! 🙂 With the project idea defined, it was time to start working on it. Since other eLab Hackerspace members were busy with other projects, it was only me and Gonçalo Pereira developing the access control system. I’ll now describe every part of the project, step by step. The door of the hackerspace is an aluminium door with an emergency exit lever. We weren’t allowed to drill or modify the door in any way, so we tried to find a way of using the lever to open the door. Gonçalo engineered a way of using the geared DC motor to pull it to open the door and also found a way of attaching the motor to the door without any drilling or glueing. He attached the motor to a piece of metal and then used the silicone frame of the aluminium door to hold it in place. It turned out to be surprisingly easy to put the motor in place. To pull the lever, he placed an off-centered pin in a gear that was already attached to the motor’s axle and then used a small piece of a pulley taken from an old printer to attach the off-centered pin to the lever. It’s basically the same type of mechanism used in car pistons. He also added a switch that would be triggered by the rotating gear when the lever was in the “open” position. 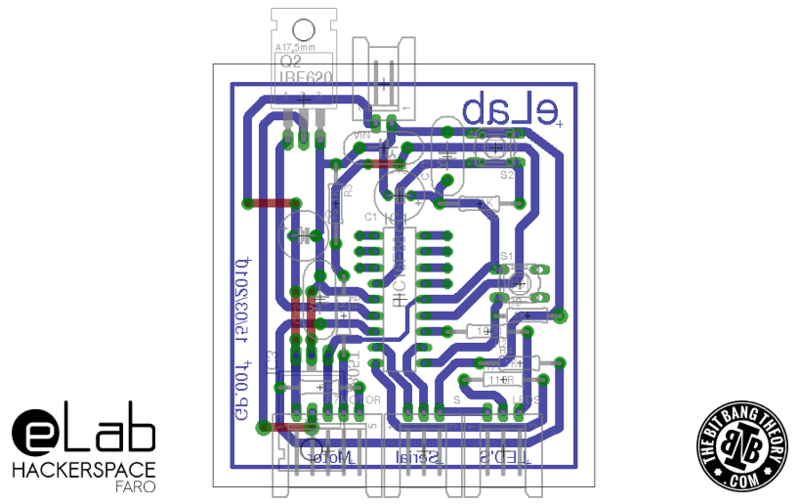 After the mechanics of the system were done, he designed a simple board with a PIC16F88 microcontroller (more details about the board on section 4) based on the PIC16F88 prototyping board that I had previously designed for us to use at the hackerspace. He also did some simple programming of the PIC16F88 just to test the door opening mechanism: when a button was clicked, it would turn on the motor until the “open” switch was activated, then wait three seconds, and then turn on the motor again until the “open” switch stopped being activated, which meant that the lever was in the “closed” position. However, we ran into our first problem: the motor was so noisy that it was generating voltage spikes in the pin that was supposed to read the switch. We tried putting the noise filtering capacitors in the motor’s pins, tried using a more stable power supply, but we weren’t being able to filter it using hardware. After some time trying to fix the problem using hardware, I remembered a simple and clever way that worked like a charm: implement a software mechanism that would ignore isolated voltage spikes. I simply implemented a counter and defined a counting threshold: the PIC16F88 would count every time that the pin read a logic 1 but would only consider that button as being activated when the threshold value was reached, The counter would increase its value with the voltage spikes, but when the switch was actually activated, the counting value would increase extremely fast, reaching the threshold value. Having the opening/closing mechanism ready, it was time to start working on the GSM part of the system. In case you didn’t know, some old cell phones such as the ones from Siemens, Nokia and Samsung are really good for electronics projects. Some of them can be used as GSM modems, having a simple serial connection and a communication protocol based on AT Commands. The amount of supported commands may vary, depending on the model of the phone and on the manufacturer. The Siemens C55 turns out to be one of the best phones for electronics projects since its GSM modem supports a wide list of AT commands. By the way, if you try to send AT commands to a phone, it may happen that it won’t echo the characters that you send it. Some phones come with the echo disabled. It may happen that you type “AT” followed by “Enter” and only receive the response “OK”. To activate the echo, you can send the command “ATE1”. To deactivate it, you can send the command “ATE0”. If you wish to know more about AT commands for the Siemens C55, see this document. The next step was to establish a serial connection between the PIC16F88 board, the Siemens C55 Cell Phone and an old computer via RS232 connection. Once again I faced some problems: the PIC16F88 was supplied with 5V and was working with TTL levels, the Siemens C55 phone required LVTTL levels and was not tolerant to TTL (it would turn itself off), and I still had to establish a connection with the computer using RS232 levels. Moreover, I had do create a UART communication with one Master (the PIC16F88 board) and two slaves (the Siemens C55 and the computer) which is something that requires a little trick to work. This trick consists in placing a diode in the Tx line of every Slave device, with the Cathode facing the device. Why is this necessary? Well, according to the UART specifications, when a device is in the inactive state (idle), its Tx pin must be high. When communication occurs, it is the Slave’s responsibility to pull the Tx line down to sink the Master Rx channel’s current. Using the diodes, when in idle state, every Slave is able to keep his own Tx high irrespective of what the master’s Rx channel is at. A single Slave can transmit by pulling his Tx line down without affecting the Tx on other slaves. Having the Master/Slave trick done, it was time to do some level conversion. To convert the 5V TTL signal from the Tx pin of the PIC16F88 to an LVTTL level, a voltage divider using two resistors was used. To convert the 3.3V LVTTL signal from the Siemens C55 Tx pin to 5V TTL, an MCP6002 Op Amp was used as a comparator, pulling the voltage level to 5V everytime the Tx signal from the cell phone passed the 2.5V threshold value, defined by a voltage divider built with two resistors. 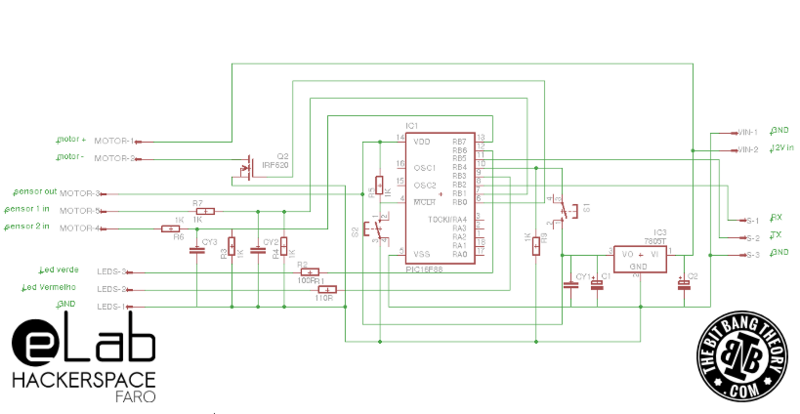 The conversion between TTL and RS232 levels was a lot simpler and was done by using a single MAX232 chip. Below you can see the PCB and the schematics where you can identify all the parts that have just been described. As referred, the board was designed by Gonçalo Pereira. 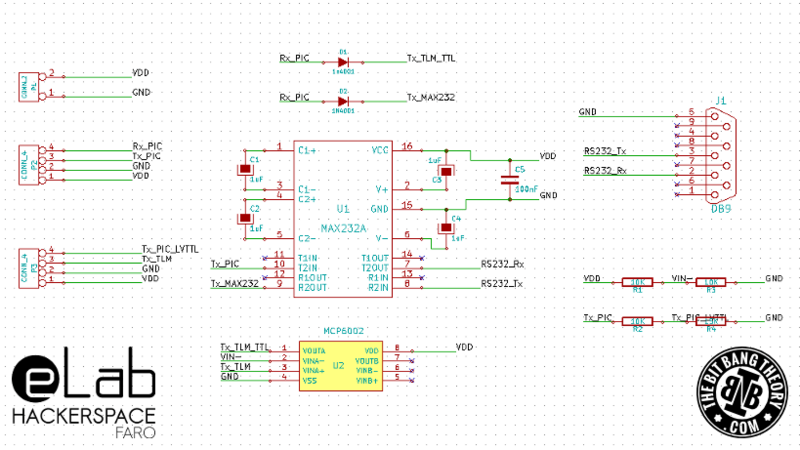 It is supposed to by powered with 12V and contains a 5V linear regulator do power the PIC microcontroller. It also contains a channel N MOSFET acting as a switch controlled by the MCU to turn the motor on and off. Besides that, it also contains all the necessary connectors for power, motor, motor switch and UART communications. The board was designed in Eagle and you can download the Eagle project files here. The firmware for the PIC16F88 is discussed and can be downloaded in the next section. 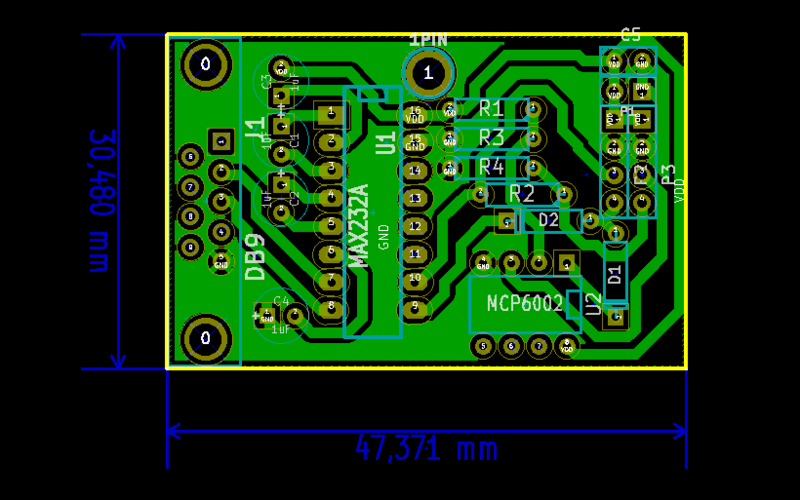 Below you can see the schematic and PCB of the board. ELAB+P=<PASSWORD> – Insert admin password to enter admin mode. The <PASSWORD> field is to be replace with the real password, hard coded in the PIC’s firmware. In case the password is accepted, the PIC emits a “AUTH OK” response. Otherwise, it replies with “NO AUTH”. ELAB+V – View the full list of numbers stored in the internal EEPROM. This command only works after the admin mode has been activated. Otherwise you’ll receive a message saying “NO AUTH”. If the command is accepted you should be replied with an “OK”. In case the command is not correctly entered the PIC will reply with “ERROR”. The default password is located in the password.txt file contained in the “PIC16F88 Control Board Firmware.zip” file. You can change it in the source code and recompile it if you want to change it. Whenever the PIC receives a CLIP message from the cell phone, it checks if the received number exists in its internal EEPROM. In case it exists, it sends a “A:<9_DIGIT_NUMBER>” to the computer. In case the number does not exist, it sends a “R:<9_DIGIT_NUMBER>” to the computer. Ill now describe what the Python source code does, in a general way. Whenever the Python application receives a “A:<9_DIGIT_NUMBER>” message from the PIC16F88, it fetches the data from the Google spreadsheet containing the eLab Hackerspace members information and checks which user has the received phone number. After checking which user has the received phone number, it plays the corresponding entrance music and it sends the entry information to the eLab Hackerspace entrance Log spreadsheet. In case it receives a “R:<9_DIGIT_NUMBER>”, it sounds the alarm sound and sends the rejected entry information to the eLab Hackerspace entrance Log spreadsheet. Below you can see the code for the Python application. If you try to use it don’t forget to change the email, password, spreadsheet key and title of the members list spreadsheet. The spreadsheet key can be found on the url of the spreadsheet after the string “key=”. I hope you liked this project. There is still a lot of room for improvement either in software or hardware. Update (05/12/13): This project has been featured on Instructables! 🙂 Check it out here. Update (12/12/13): This project has been featured on Hack a Day! 🙂 check it out here. Great idea, but code link failure, please update, thank you! Hi! Thanks for your comment. All the code links are fixed now.